My name is Constantine Santas. I was born and raised in Lefkada, Greece. After serving in the Greek army for three years, I came to the United States on a scholarship from Knox College, where I graduated with a B.A. in English, in 1961. Then, I attended the University of Illinois at Urbana, Illinois, on a fellowship, and I earned a M.A. in English, in 1962. Following, I attended Northwestern University, Evanston, Illinois, and I earned my Ph.D. in English and American Literature, in 1971. I taught at Milwaukee-Downer College (1962-1964), the University of Illinois (1964-1971), and I served as chair of the English Department at Flagler College from (1971-2002). I taught a variety of subjects, principally English, American, and world literature, and literary criticism. In 1987, I taught the first film course, Film Literature, which soon developed into interest in writing about film. This course was also the subject of my first book, Responding to Film. My interest in film had started when I was a graduate student at the University of Illinois. I joined a group that used to discuss films of great directors, such as Federico Fellini, Ingmar Bergman, and Akira Kurosawa, among others. During my tenure at the University of Illinois, some of the group’s members formed an unnamed film club, which I joined. Together we went mostly to foreign movie theaters, which abounded in the city, and then formed discussion groups where we talked freely and creatively about the movies we watched. A few of us asked students to watch movies in groups, at reduced prices, and then discussed them in class. This gave me the first feel for critical approach to movies, which became the basis for much writing on the subject later—as four books were accepted and published between 2002 and 2014. I am currently working on two more projects on film, which I hope will turn into new volumes soon enough. I have also completed a translation of Homer’s The Odyssey, with Dr. Antonio T. de Nicolas, of Stony Brook, and we are now in search of publishers. That alone took eight years of effort, and it will be sigh of relief when this project sees the light of day. I have also written numerous stories about my youth in Greece, and these will be the basis of a memoir. I enjoy classical music, movies, gardening, and early morning walks. I am a compulsive email writer and retain friends and acquaintances in Facebook, and professional ties in LinkedIn. I also retain close relationships with many friends at Flagler and internationally with people from Australia, UK, Greece, Canada, and many places in the US. 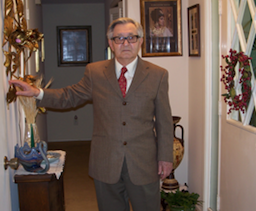 I keep in touch with relatives, mostly my brother, Gerasimos Santas, a Professor Emeritus at the University of California at Irvine, and a world known scholar. I am also a member of SASS, a group of retired professors of Flagler College, meeting once month for social interaction. I live with my wife, Mary, in St. Augustine, Florida. We have three adult children, three grandchildren, and one great-grandchild. My wife and I are members of the Holy Trinity Greek Orthodox Church, and we participate in social activities of the Greek community of St. Augustine.